It was a strangely sunny October day when our four fantastic fundraisers started the first of the thirteen miles that make up the 2017 Royal Parks Half Marathon. We were so proud of our runners, who put in all the effort to train and fundraise in the months leading up to the big day, before performing brilliantly across the entire 13.1 mile course – raising over £2500 to help London to love later life in the process! We’re delighted to announce that this year we’re going to do the whole thing all over again – only bigger! With double the spaces available, there’s no better time to take part in the Royal Parks Half Marathon on behalf of Age UK London! Now in its eleventh year, The Royal Parks Half Marathon has seen more than 128,000 runners cross the finish line while raising over £35m for more than 750 charities of all sizes. This award-winning event was initially set up as an annual fundraising initiative, raising sustainable funds for the Royal Parks Foundation to support London’s eight Royal Parks, and enabling charities of all sizes to be involved in a major challenge event. 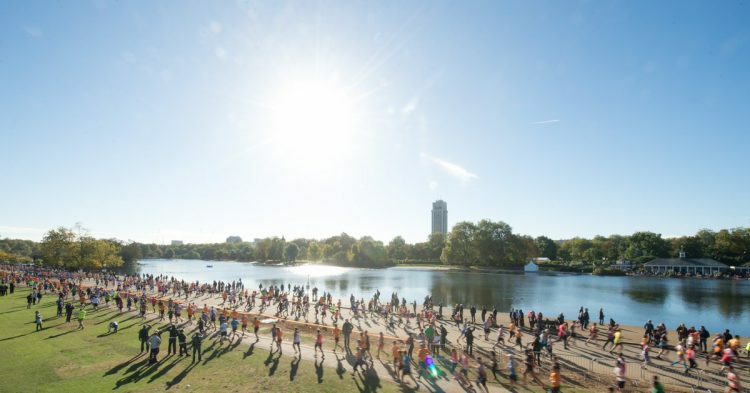 The Royal Parks Half Marathon also boasts one of the most scenic marathon routes in the land, taking in London’s world-famous landmarks on closed roads, including four of the eight Royal Parks – Hyde Park, The Green Park, St James’s Park and Kensington Gardens. Perhaps most importantly of all, there are no hills on the course, so the gently undulating route is perfect for both seasoned professionals and absolute beginners! Whether you’re a regular runner or you don’t even own a pair of trainers, there’s plenty of time to get things in place before Sunday October 14th! Whether you’re passionate about social justice, looking for a physical challenge, or aiming to raise money on behalf of a family member, we want to hear from you! Both Age UK London and the Royal Parks Half Marathon itself will be there to support you every step of the way, with training tips, a race pack and even fundraising assistance as the big day approaches. Plus there’s nothing quite like the event itself, you’ll be buoyed along by the roar of the crowds of volunteers as well as the support of your friends and family – who also get to spend time in the amazing festival village while you’re heading round the track. The atmosphere is amazing, as thousands of runners all pull together to raise money for some fantastic causes, before celebrating at the end having accomplished something truly special. So, what are you waiting for?! Now is the time to get in touch and book your place before it’s too late! Email gharvey@ageuklondon.org.uk to start the sign up process. We’ll see you on the starting line!